MainAll NewsInside IsraelWill Ze'ev Elkin appoint an Arab deputy mayor of Jerusalem? 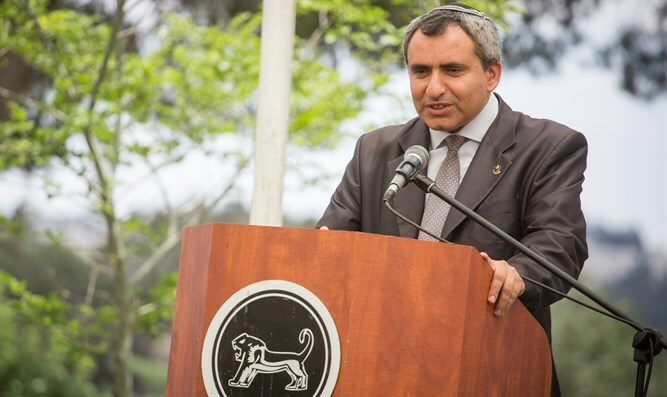 Will Ze'ev Elkin appoint an Arab deputy mayor of Jerusalem? Candidate for mayor of capital says there will never be an Arab mayor of Jerusalem, but Arab deputy mayors would be good for city. Jerusalem Affairs Minister Ze'ev Elkin, who is running for mayor of Jerusalem, stated that he supports the appointment of one or more Arab deputy mayors. "There will not be an Arab mayor here, but if there is a deputy or two Arabs, it will only make things better for the city and for them," Elkin said in an interview with Haaretz. Elkin, a member of the political-security cabinet, has been living in Jerusalem for the last few weeks and meets daily with many residents in an attempt to enlist their support for the upcoming municipal elections on October 20, 2018. Elkin had sought the support of Prime Minister Binyamin Netanyahu for his candidacy for a long time. Such a move would have allowed Elkin to receive funds from the Likud for his campaign. However, to date Netanyahu has refused to declare support for any of the candidates. The other candidates for mayor include current Deputy Mayor Moshe Leon, Chairman of the Awakening Movement Ofer Berkowitz, MK Nahman Shai, and former Jerusalem City Legal Advisors Yossi Havilio and Avi Salman.